An evacuee uses a paper fan as she rests at Okada elementary school that is used as an evacuation center in Mabi town in Kurashiki, Okayama Prefecture, Japan, July 12, 2018. 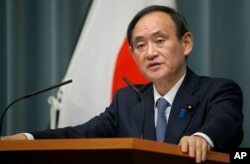 Japan risks more severe weather and must find ways to alleviate disasters, a government spokesman said Thursday, as intense heat and water shortages raised fear of disease among survivors of its worst weather disaster in 36 years. 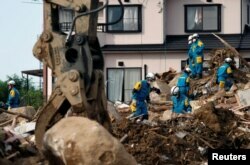 Rescue workers search for missing people at a landslide site caused by heavy rain in Kumano Town, Hiroshima Prefecture, Japan, July 11, 2018.